Although I travel to San Francisco at least once I year, I don’t get to see many friends as I’m in the City to spend time with family. However, this time, I made a point of getting in touch with Amera Rizk an old Carnegie Mellon University friend who is an editor at Pixar. 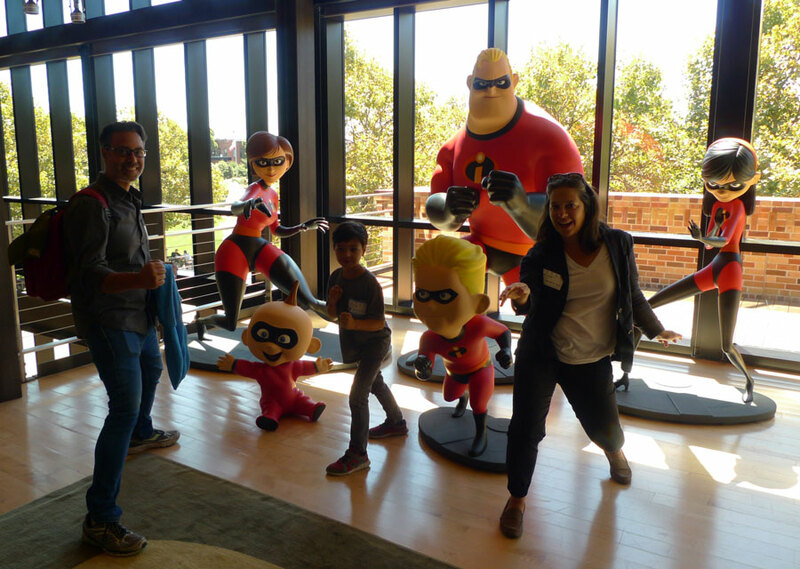 This past Wednesday, Amera gave us the royal treatment as we got to tour the Steve Jobs Pixar building, pose with the Incredibles and even get a sound wave and microphone lesson in the Pixar sound recording studio. 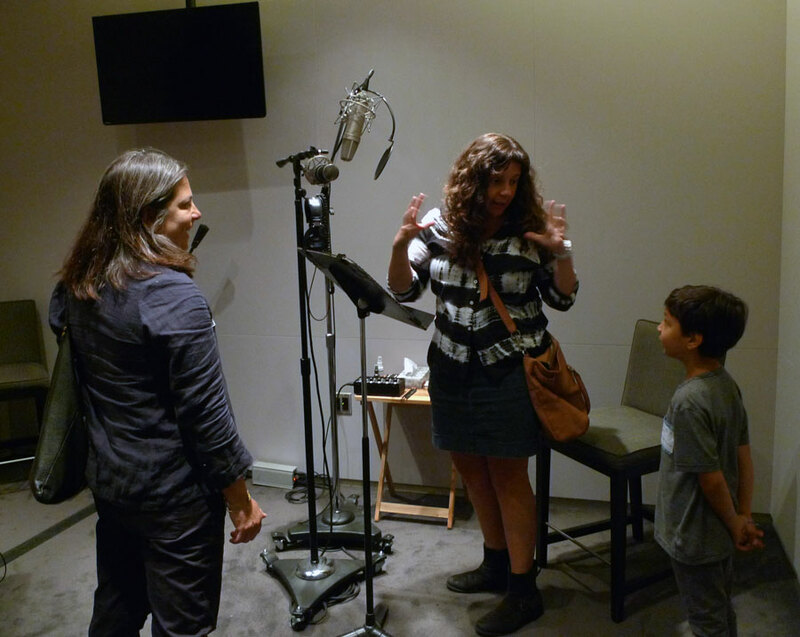 It was a huge treat for Iggy to learn about the steps that it take to produce a Pixar animation from initial concept sketches to creating models of the characters, story development, storyboarding, environment design, 3D movements… Amera took us through the elaborate animator studios and much more. I was amazed by the outdoor lap pool, it would be nice to work at a place that provides amazing exercise facilities. Unfortunately we couldn’t take pictures or see much of the Brooklyn building as that’s where the current projects are in production. 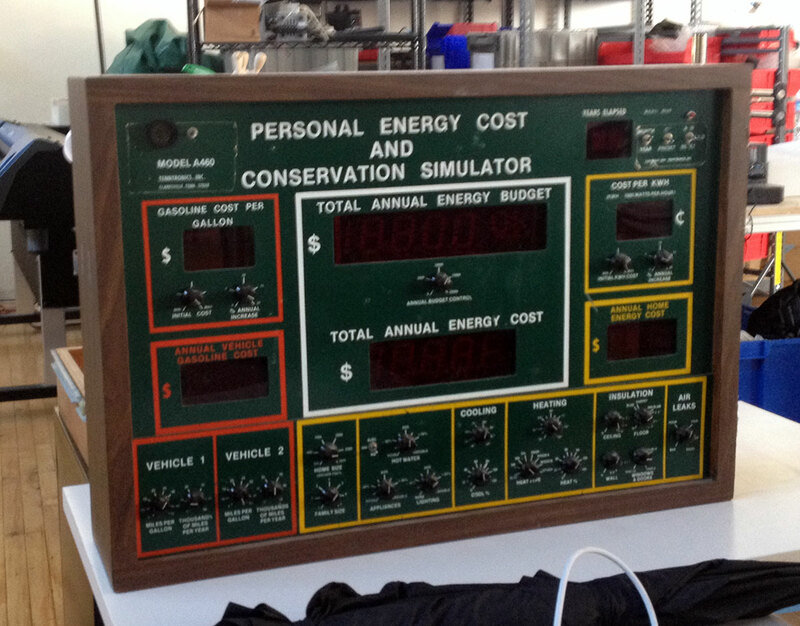 This past Friday, we made two San Francisco tech excursions. First was lunch with Brooke’s cousin Jimmy Singer at Google’s San Francisco building. At Pixar, Amera treated us to lunch, at Google, lunch was on Google as meals are provided! I only wish I had skipped breakfast. As we were not at the Google campus, the Google visit was not nearly as exciting as Pixar… It wasn’t a creative’s playground. But we did enjoy a beautiful view of the Bay Bridge along with a delicious meal with Jimmy’s company. 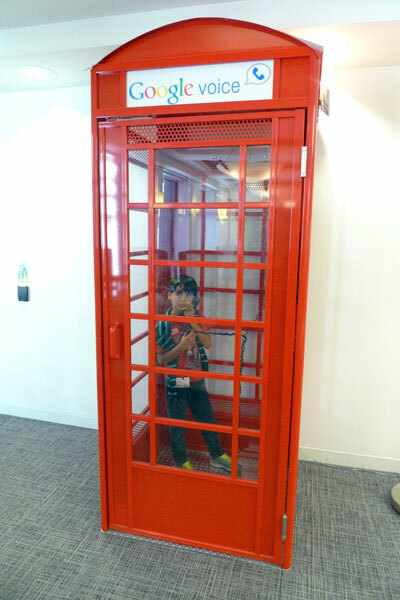 Here’s Iggy’s cousin, Joaquin Zuniga making an around the world call in Google’s 4th Floor reception office. From Google we headed to the California Academy of Science to enjoy the rain forest environments and then to the Otherlab to have beer and pizza with Brooke’s old collaborator Jamie Schulte and his family. Saul Griffith the founder of Otherlab likes to throw the garage door open, blow up the jumpy castle and have a party on Friday afternoons. It took me a while to get Iggy out of the jumpy castle in order to head upstairs and box by controlling the pnuematic robots. Once the boys were up there trying to knock the head off the opponent’s robot, they forgot all about the jumpy castle. 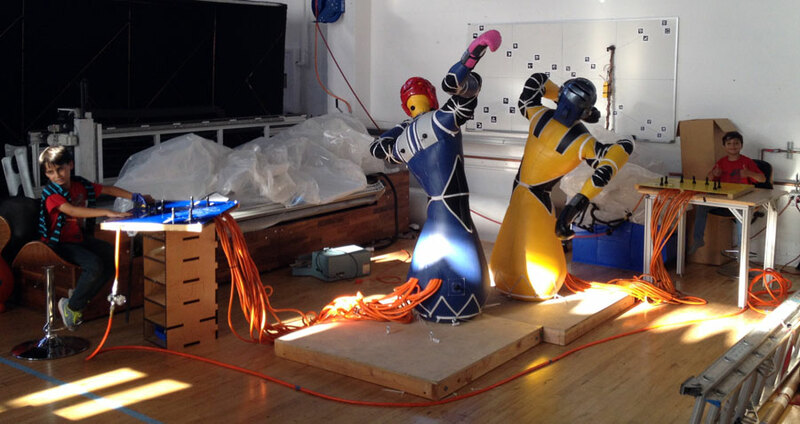 It was great to get a peak at all the interesting work going on at Otherlab. There’s so much amazing work being done in such a tiny area of land that is the Bay Area!